The Golden Horseshoe Food and Farming Alliance, in partnership with the Toronto Region Conservation Authority, is among 15 recipients from across the province to receive funding for exciting local food projects. The more than $315,000 in new funding from the Government of Ontario and the Greenbelt Fund is aimed at increasing access to local food, and supporting the growth of the province’s agri-food sector. “These investments strengthen our agri-food value chain which means more local food on Ontarians’ plates,” the news release states. We are thankful and thrilled to receive $20,000 in funding for our project, Serving Up Local Food Training at Long-Term Care Facilities. The project will build on the success of our two-year local food procurement initiative, Serving Up Local, adding a comprehensive local food literacy initiative to train long-term care (LTC) professionals and frontline staff on local food offerings, to ultimately get more LTC residents choosing, eating and enjoying Ontario foods. Stay tuned for more information! 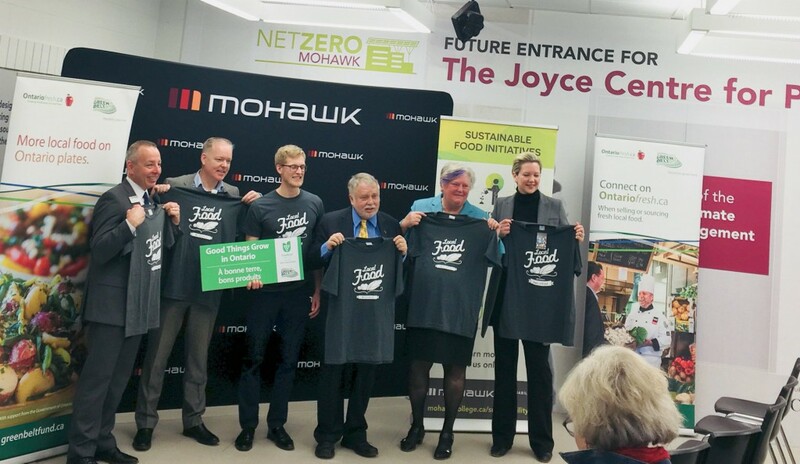 The announcement was made at Mohawk College, who received $30,000 to develop a Local Food Procurement Training Program for Industry Professionals. The online professional certification program will teach foodservice staff local food procurement skills, including how to develop menus that maximize the use of local foods. Artisan Farms Direct Ltd. from Mississauga received $25,000 to develop a meat distribution terminal that will provide a centralized hub for further distribution to grocery and foodservice sectors, like the Ontario Food Terminal does for produce. Casa Bonita Foods Inc. in North York received $21,000 to invest in new equipment to increase production capacity for their Mexican-style corn tortillas and tortilla chips, using Ontario flour. Open Food Network Canada received $10,000 to customize an open source e-commerce/logistics platform for Ontario Food Hubs. Parkdale Active Recreation Centre in Toronto received $10,000 to expand its FoodReach program, which provides nutritious meals for schools without food preparation areas. They will also upgrade the ordering system to label products that are locally grown. St. Luke’s Anglican Church in Burlington received $10,000 to convert their commercial kitchen into an incubator kitchen, with outreach programming targeting New Canadian entrepreneurs. They will also partner with Feed Halton to trial a pop-up market that provides fresh local produce at a low cost. West End Food Co-op in Toronto received $15,000 to expand its local food offerings and in-store promotion of made-in-house local foods, and begin purchasing directly from additional farmers. Youth Action Network (Black Farmers & Food Growers Collective) in Toronto received $14,550 to scale up its world crops production to provide culturally appropriate produce at local farmers’ markets, as well as provide entrepreneurship, farming and food literacy training for youth and those who are food insecure. For a full list of recipients, check out the Greenbelt Fund website. We are excited to see—and be a part of—what grows from these most recent investments!